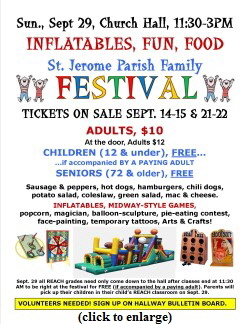 Started in 1999 and held in early fall each year on a Sunday close to the September 30th feast day of Saint Jerome, the St. Jerome’s Parish Festival celebrates our parish and its parishioners. Parish volunteers handle all pre-Festival preparations and on-site activities. An enterprise as large as this Festival, attended by over 325 adults and children, requires the work of many hands. We greatly welcome, call for, and need parishioner volunteers to organize and staff the many events of the day. Suzanne Calnon headed the festival for its first 13 years and showed remarkable leadership in creating and maintaining this community-building parish event. 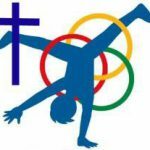 For a description of the Festival itself, see the Parish Events page.